Twenty-five years ago, people who needed an alternative to dairy milk turned to soy milk. Then rice milk arrived. Today there’s quite a selection of non-dairy milks: almond, cashew, coconut, flax, hemp, oat, rice and soy. Since 1999, according to market research firm Euromonitor, plant-based alternatives milks have grown in annual sales by an average of 10.9%. They are now a $1 billion-plus category in domestic retail sales. The trend is based on personal factors: allergies, kosher and vegan diets, lactose intolerance and sustainable lifestyles (the manure and flatulence of dairy animals produce huge amounts of methane, a major greenhouse gas. Here’s more information). As with dairy milks*, each plant-based milk has a different flavor and nutritional profile. Although we drink a large amount of cow’s milk, we like plant-based milks for different reasons: chocolate and green tea almond or soy milk for a refreshing drink, cashew milk as a delicious newcomer, coconut milk for cooking. We especially like coconut in creamy soups. It gives a slight Thai twist; add hot chile slices and lemongrass for the full Thai experience. Some of our favorite thai dishes include coconut rice, coconut curried chicken, coconut pumpkin soup, and our beloved tom ka gai, coconut chicken soup. All get their coconut flavor from unsweetened coconut milk. But for today, here’s a fusion soup: chowder with coconut milk. It has another popular Thai ingredient too: hot chile slices. Sea bass is poached in coconut milk for this extra rich and velvety hearty chowder. DiscoverCaliforniaWines.com, which gave us the recipe, suggests that it be paired with California chardonnay or viognier. 2. ADD the onions, garlic, and jalapeño; cook, stirring for 1 minute. 6. DIVIDE the chowder among 4 bowls. Squeeze the juice of one lime wedge over each serving. *The list of animal milks drunk worldwide includes camel, cow, donkey, goat, horse, llama, reindeer, sheep, water buffalo and yak. 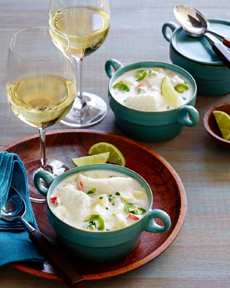 Fish chowder with coconut milk (photo courtesy Discover California Wines). The recipe is below. 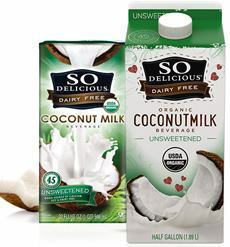 Coconut milk is available in cartons and cans (photo courtesy So Delicious). 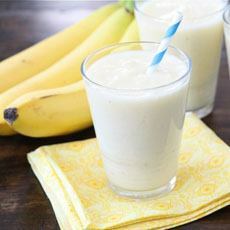 Try coconut milk in your next banana smoothie (this recipe has pineapple as well, from Makes And Takes). 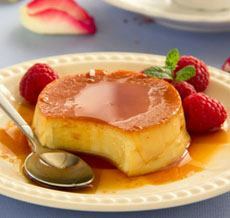 Many desserts can be made with coconut milk, from ice cream to this coconut milk flan (here’s the recipe from Care 2). Consommé, clarified into an elegant, clear liquid (photo courtesy Picholine | NYC. Chowder, here the chunkiest soup, packed with goodies. 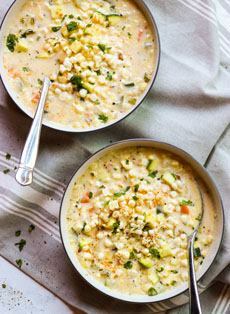 Here’s the recipe for this corn and zucchini chowder from LittleBroken.com. Some, like Manhattan clam chowder, do not contain dairy. 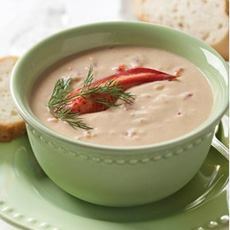 Bisque is a creamy seafood soup, pureed into smoothness (photo courtesy MackenzieLtd.com). Bisque: A thick, creamy soup that traditionally was made from puréed shellfish. 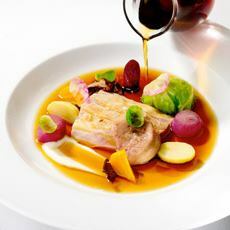 Today bisques are also made from fruits, game fish and vegetables. Broth & Stock: Liquids in which meat, fish, grains or vegetables have been simmered. The difference between a broth and a stock is that broth is made from the desirable ingredients; stock is made from “leftovers” such as bones and skin; thus broth is richer and more nourishing than stock. Both are used as a base for soups and gravies. Chowder: Chunky soups thickened with flour. The main ingredient chowder can range widely, including chicken, corn, fish and seafood. Consommé: A broth that has been clarification. This means that egg whites or other ingredients are boiled in the broth to coagulate the sediment, resulting in a clear, elegant-looking soup. Gumbo: A dish that can fall into the soup or stew category, a strong stock of meat and/or fish/seafood, with pieces of the protein and a variety of vegetables, served over rice. Gumbo is traditionally thickened with okra or filé powder (from the sassfras tree) and vegetables. A gumbo is traditionally served over rice. Gravy: Gravy is not a soup, but a sauce; although Americans have often turned canned soups into sauces. Gravies are made from the juices of cooked meat or vegetables after they have been cooked. Almost all gravies start with a roux (ROO), a mixture of flour and butter; and are thickened with starch (flour, corn starch, arrowroot, etc). Purée: Some soups are puréed into smoothness. A purée can be considered a vegetable or grain/pulse counterpoint to a bisque. The technique also produces smooth apple sauce, whipped potatoes and puréed vegetables (carrot purée, broccoli purée, etc.). Ragout: The French term for a main-dish stew. Note that in Italian, n Italian cuisine, ragù is a meat-based pasta sauce. Soup: Any combination of ingredients cooked in a liquid base: fish/seafood, fruit, meats, starches and vegetables. Soups can be thick and hearty or thin and delicate. While cooked ingredients can remain in the soup, the objective of the ingredients is to flavor the liquid. Soup can be served warm, room temperature or chilled. Fruit soups can be served for starters or desserts. Stew: A hearty dish made from proteins, vegetables, pulses, etc., simmered in a liquid (water, broth, stock, wine, beer) and then served in the resulting gravy. Stewing is a technique to cook less tender cuts of meat: The slow cooking method tenderizes the meat and the lower temperature allows the flavors to combine. There is a thin line between soups and chunky soups; generally, stews contain less liquid. Sometimes the name is adopted for a soup. Oyster Stew, for example, is a thick soup with butter and milk or cream, like a bisque.